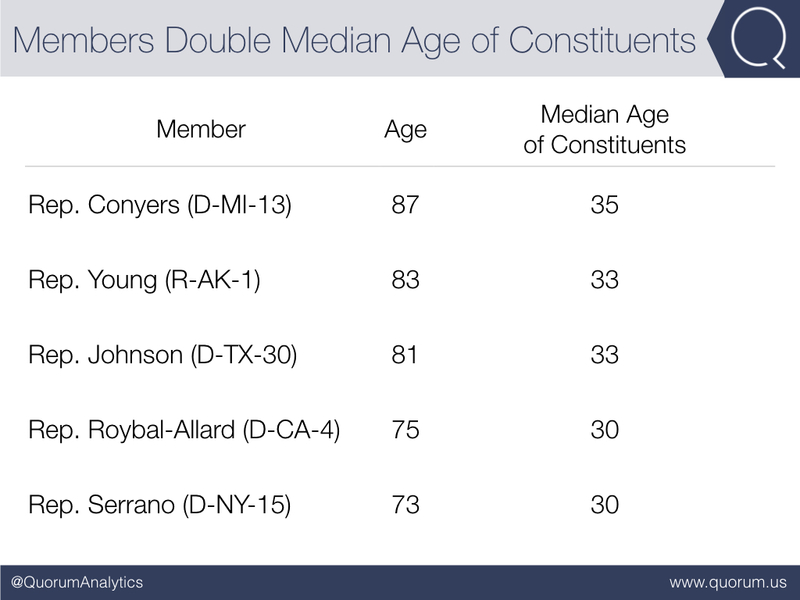 Today the average American is 20 years younger than their representative in Congress. This should come as no surprise, considering that over the past 30 years the average age of a Member of Congress has increased with almost every new Congress. In 1981, the average age of a Representative was 49 and the average of a Senator was 53. Today, the average age of a Representative is 57 and the average of a Senator is 61. This prompted us to take a further look at those graying averages. Go beyond the age of Congress: learn how bipartisanship has decreased by 30% since 1989. Democratic leaders in the House are two decades older than Republican leaders. 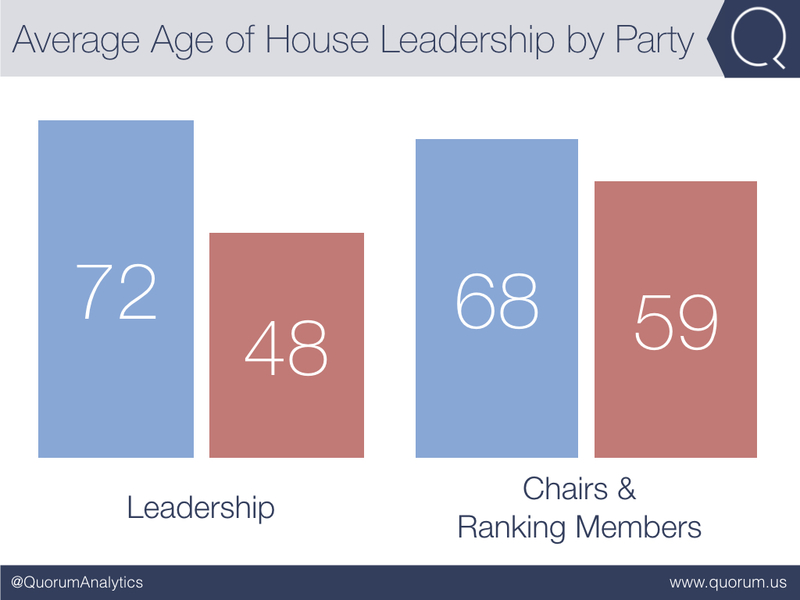 The average age of the Democratic House leadership is 72 years old, whereas the average age of Republican House leadership is 48 years old. This trend continues in House committee leadership with Republican chairmen averaging 59 years old and ranking Democrats averaging 68 years old. 1/3 of Representatives over 60 represent districts with a median age of 35 or less. There are 44 congressional districts in which the age of the Representative is more than double the median age of their constituents. Of these 44 Representatives, 38 won their last election by more than 60% of the vote. The following Representatives are particular outliers of this analysis. 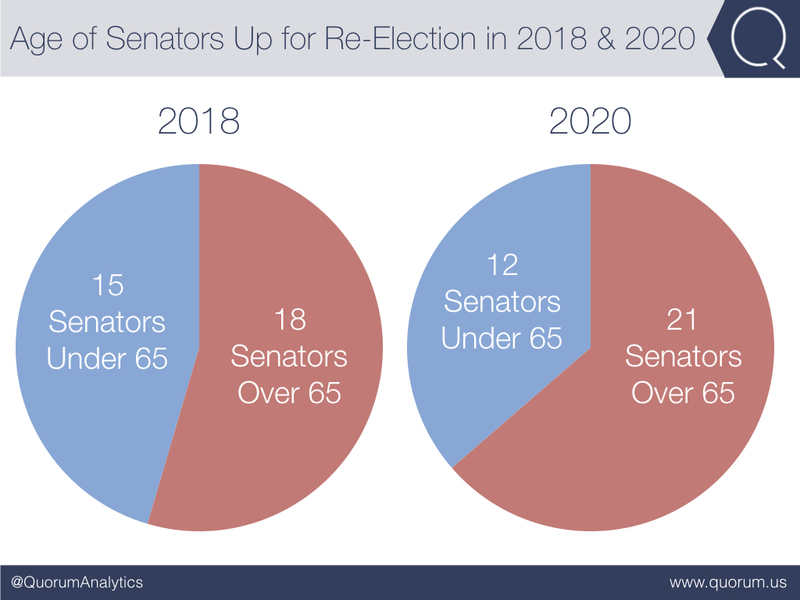 More than half of the Senators up for reelection in 2018 will be over the age of 65. 18 of the 33 Senators running for reelection in 2018 will be 65 or older. If they win, another six years in office would put Senators Feinstein, Hatch, Nelson, and Sanders well into their 80s. Looking ahead at the 2020 elections, 21 of the 33 Senators running for reelection will be 65 or older. The current chamber is already one of the oldest Senates by some measures according to the Washington Post, and the data suggests this trend would continue in the coming years. President Trump's call for term limits. On the campaign trail President Trump vowed to “propose a constitutional amendment to impose term limits on all members of Congress” as part of his “Contract with the American Voter.” Congressional term limits are far from a new idea and are often considered a possible solution to the aging of Congress. However, past proposals have all failed to garner the two-thirds majority in both chambers required for a constitutional amendment. While the White House is sure to face opposition from Congress on such a proposal, if there’s anything this past week has taught us -- President Trump plans on following through. See a breakdown by chamber of what would happen if term limits were implemented.